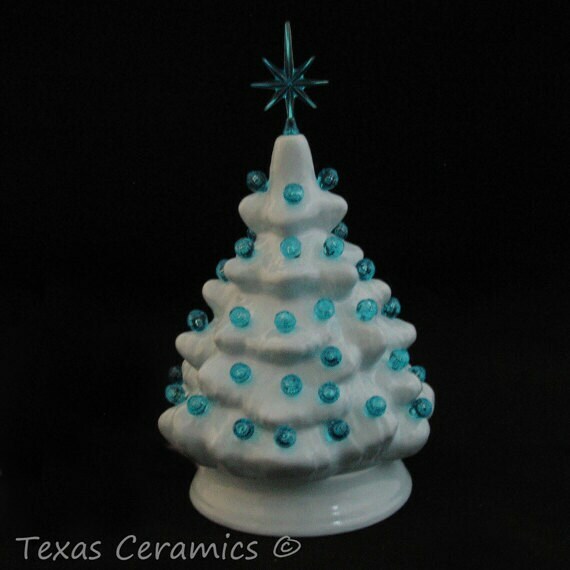 This small ceramic Christmas Tree is finished in a light blue glaze and decorated with aqua color round lights and aqua color snowflake star . This miniature tabletop tree is adorable measuring a little over 6 inches tall. This tree can be used in a boys room as a night light. .•:*¨¨*:•.Please note: This tree is made to order, the processing time needed to complete your order is noted in the Shipping Section. Once your order is completed you will be notified that it has shipped, please allow for transit time once the order ships..•:*¨¨*:•. 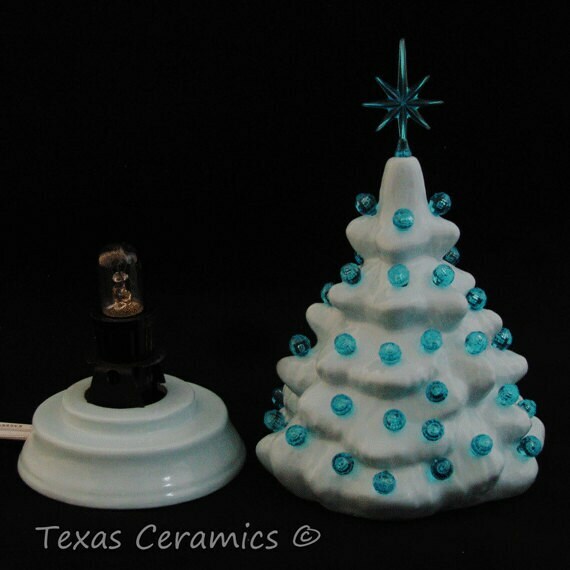 This mini ceramic Christmas tree is easy to set it up on your office desk or cubie at work. It also makes a great gift and will be cherished by anyone you give it to. 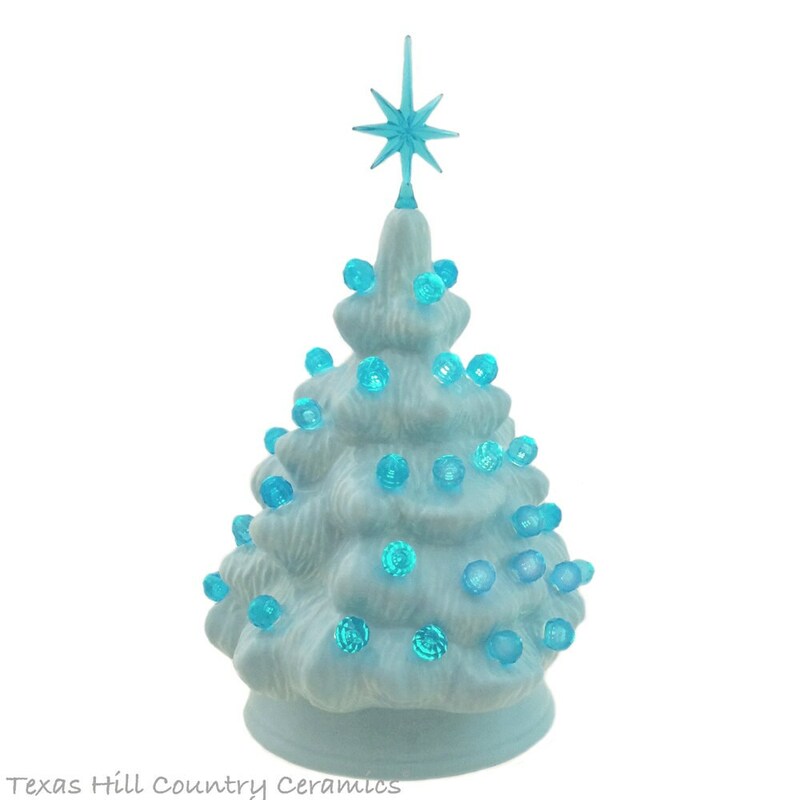 This classic ceramic tree and base is glazed in a soft blue glaze. Three full coats of light blue glaze are applied to the tree with a brush. The blue Christmas tree is decorated with aqua round ornament globes that have been secured in place with non-toxic white glue. The tree is topped with a aqua blue snowflake star that is proportioned to the size of the tree. The base is wired with a UL approved "snap in" light fixture. On the cord is a rotating dial switch so you can leave it plugged in and easily switch your tree on whenever you want. The cord is 6 foot long and a 6 watt bulb is included. All bases are wired with a UL approved light fixture and plug that is standard for electrical systems used the USA. Light bulbs sent with the tree are for USA electrical systems as well. 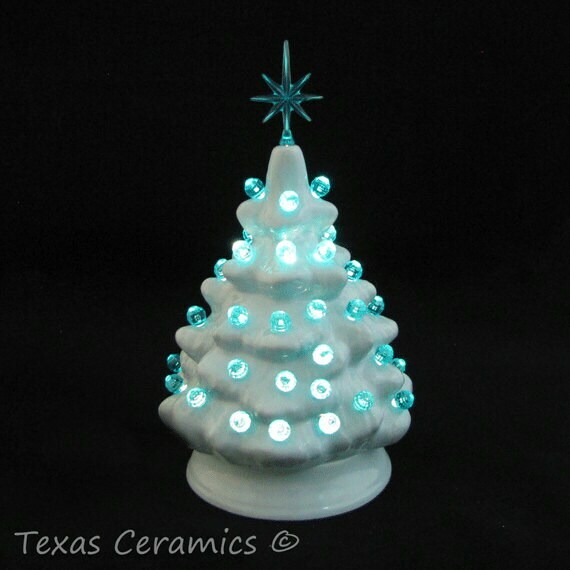 All ceramic trees are made in my studio in central Texas and crafted with care and love. My trees are made to last for many years to come. Beautiful little tree. Very well made. Best I've ever seen. Love them!